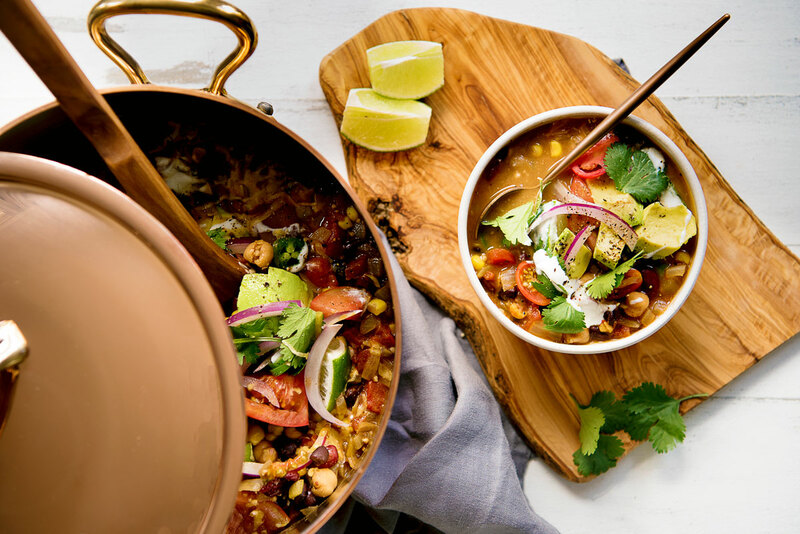 Stay warm with this stovetop Vegetarian Taco Soup Recipe that is an easy one pot recipe. It’s also healthy, gluten-free and has a vegan option. We’re only a week into November and I’ve already started to feel the holiday rush. 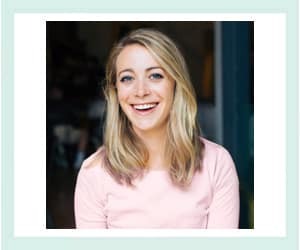 You know that feeling that your ‘To Do’ list is growing at an alarming rate and then you realize you haven’t booked flights for your trip home yet? And you still need to get a flu shot? And now thanks to daylight savings it’s suddenly dark at 5pm? 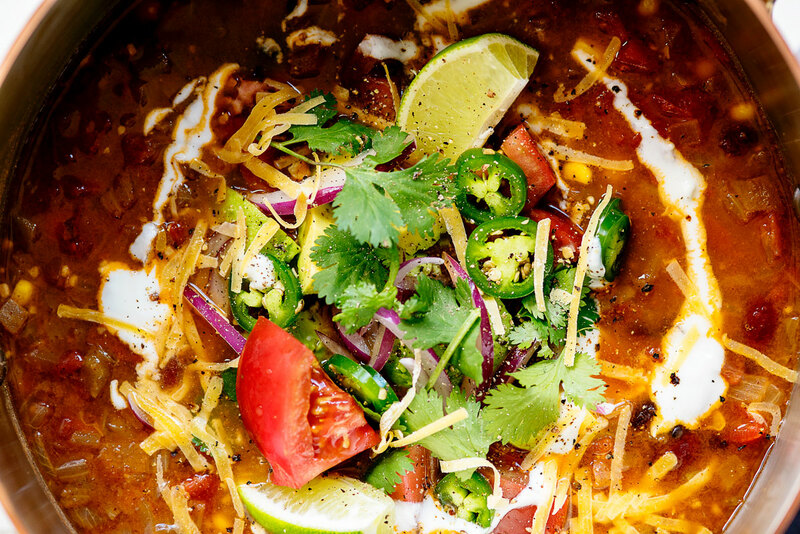 These (literally) dark times call for easy comfort food, like this vegetarian taco soup. This soup is also as easy as can be, with only one pot needed. That means easy clean up and less hassle. 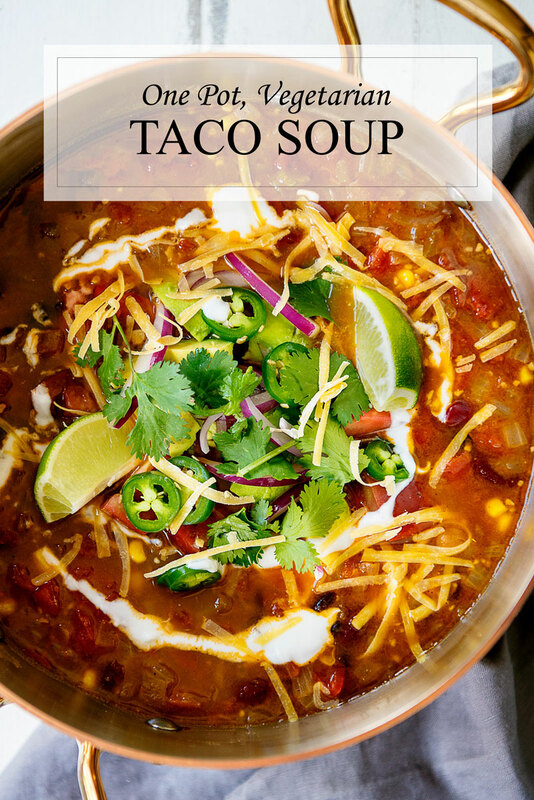 Read on for the vegetarian taco soup recipe! In addition to being vegetarian and packed with healthy protein, it’s also easy to make it totally vegan by omitting the sour cream and shredded cheese topping. 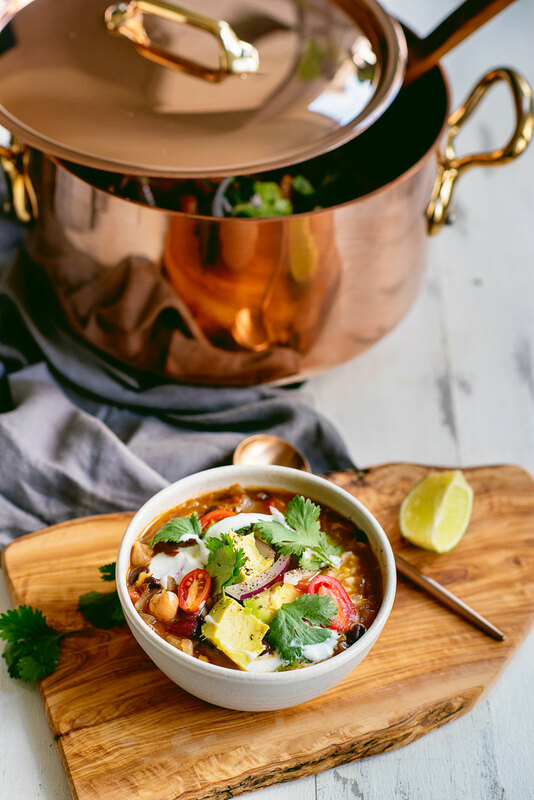 Speaking of one pot recipes – we recent upgraded our decade-old soup pot to a gorgeous Mauviel copper stockpot. The difference has been life changing. Copper might seem intimidating but it’s actually super user-friendly! It is unrivaled in its ability heat and cool quickly and Mauviel is the best in the game. Because of that, everything can be cooked on low to medium low heat. It heats uniformly at these low temperatures meaning bits of food don’t burn in one spot. The handles also stay cool during use. And it’s pretty. Sooooooooooo pretty. Mauviel is the choice of so many top chefs around the world who put their pans through their paces dozens of times per day for years. I know if these pans can stand up to the rigors of a professional kitchen it will last us a lifetime. Mauviel stands by this too with a lifetime warranty on all of their pans. Interested in starting your own Mauviel collection? Here are some of my favorites. These are also great for holiday gifts or for a gift registry if you have a special occasion coming up. 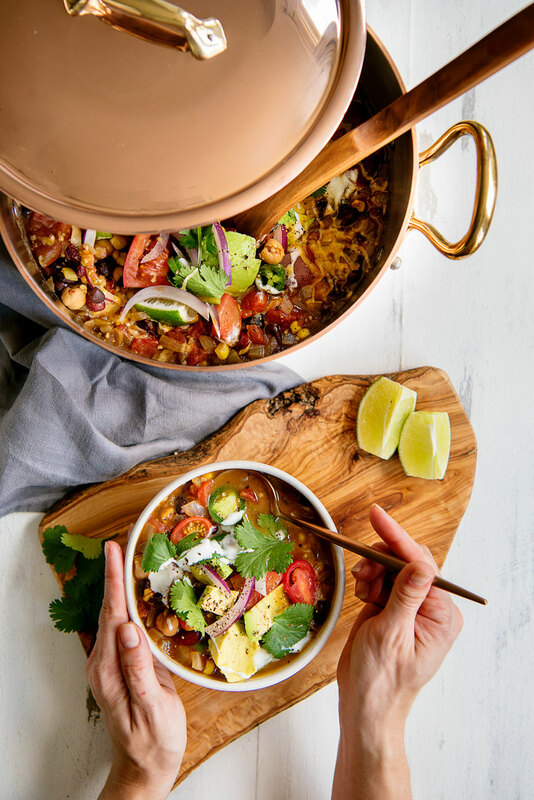 It’s an easy one pot recipe. Healthy protein from beans makes this soup so filling you won’t miss the meat. 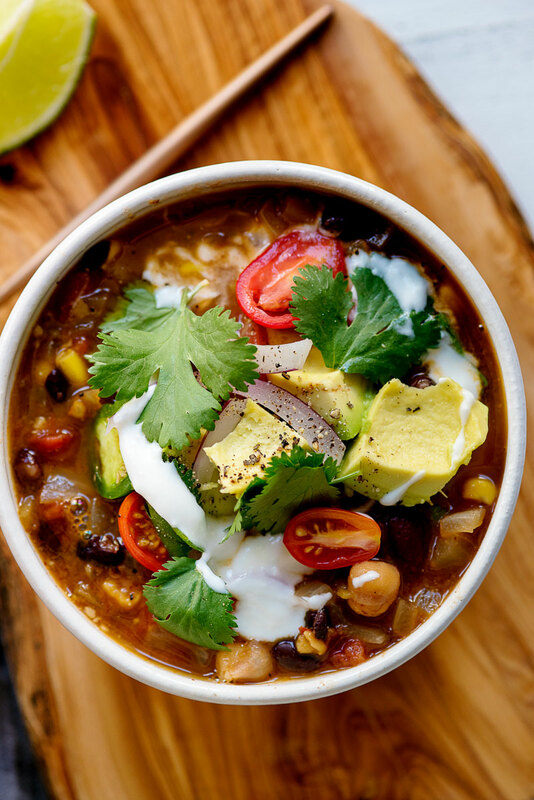 This is a fun spin on chili that will keep you warm all winter long. For an optional vegan version just omit the cheese and sour cream. 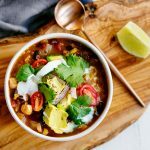 Stay warm with this stovetop Vegetarian Taco Soup Recipe that is an easy one pot recipe. It’s also healthy, gluten free and has a vegan option. Heat olive oil in a large saucepan over medium Heat. Sauté onion until soft and translucent. Add the taco seasoning, minced garlic, salt and pepper and stir until fragrant, about 30 seconds. Add the green chiles and broth. Heat until simmering. Stir in the beans and diced tomatoes. Simmer on low heat uncovered for 30 minutes. Stir in the corn and heat thoroughly. Stir in the lime juice. Salt and pepper to taste. Finish with chopped fresh tomatoes, cheddar cheese, sour cream, cilantro, red onion, and sliced jalapeño.